The fourth stop on the USATF Southern California Road Running Grand Prix Series comes to the Brentwood 5 km, on Sunday, May 29, 2011. Team competition in the new Grand Prix series is sure to heat up when some nation's finest distance runners take the starting line. Club Ed Running continues to hold the overall Grand Prix lead with The Janes Elite Racing in hot pursuit and Cal Coast Track Club in contention as well. Regular Brentwood 5 km competitors include top running clubs like the Fluffy Bunnies and Nike Team Run LA and expect to hear more from Team Runners High, So Cal Road Runners, Gritty City Track Club, Equalizers, A Snail's Pace Running Club and Track Club L.A., all clubs posting scores in the 2011 series. These clubs include more than a few local running heroes who range in age from 19 to 69. USATF medals will be awarded to the top three open and masters USATF finishers at the Brentwood 5K, and the first male and female overall runners will receive a USATF Southern California Association red or blue gym bag. For a limited time only, a special discount is available to USATF Southern California Association members who register online. When checking out, enter the discount code USATFbrentwood for a $5 discount off registration fees! This discount is available only to current 2011 Southern California USATF members! Registration fees increase after May 23, 2011, from $30 to $35. Online registration closes on May 26, 2011 at 11:59 pm. 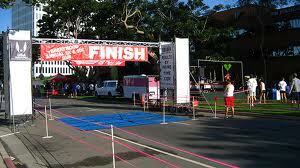 The Brentwood 5 km is part of the 2011 USATF Southern California Association Road Running Grand Prix. This is the fourth race in the 9-race series. A minimum of five (5) races is required to be eligible for the year-end prize money and awards. The Grand Prix provides a total of $2,000 in cash awards and championship medals to the top-5 overall men's and women's individual scorers. Gold, silver, and bronze USATF medals will also be awarded to the top-3 scorers in 26 men's and women's 5-year age-groups. Championship plaques will be awarded to the top-5 scoring clubs. As with individual runners, clubs must also field teams for a minimum of five races. For more information on the 2011 USATF Southern California Association Road Running Grand Prix Series and to see the current Grand Prix rankings, please visit: www.scagrandprix.org.